Mocca Moocho01924 361755work CafeMocca Moocho is run by a husband and wife team along with a number of staff, many of whom have worked with the owners for a number of years. The staff are professional and friendly towards customers. The food offered is mainly catered for breakfast, lunch and light teas. There are great coffees, a selection of fresh sandwichs, salads and of course homemade cakes, scones and pastries. All made on the premises from natural ingredients. No pre-prepared mixes used here! 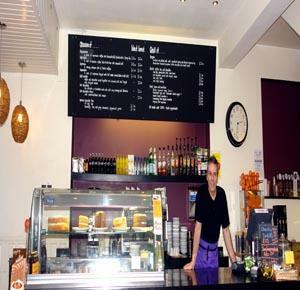 The cafe offers a relaxed and cosy atmosphere with comfy seating and a sofa lounge upstairs. Al fresco dining outside accommodates 44 guests and there is cool music and Wi fi for customers. Mocca Moocho is run by a husband and wife team along with a number of staff, many of whom have worked with the owners for a number of years. The staff are professional and friendly towards customers. All the food is purchased from local accredited suppliers who are chosen for their commitment to quality and service. The cafe is open 8.30am to 5.30pm Monday to Saturday and 10.30am to 4.30pm on Sunday.